"A thing of beauty is a joy forever: its loveliness increases; it will never Pass into nothingness; "
Perhaps this quote by John Keats sums up why I choose to create decoys and other art. Bringing into being a useful work of art is, and always will be my goal; making something pleasing to the eye of the hunter and collector that will be passed down through generations. I would like to thank everyone who has taken their time to visit this site. It is a joy for me to share my interest in decoys with the many great people I have met through my work. I am a married father of two, who besides carving, enjoys spending time with my family, fishing, reading, and exploring rural New Jersey. I am fortunate to be a professional carver and artist. I began working with wood at the age of 12 beside my Dad in his cabinet shop. This helped instill in me a deep appreciation for handmade goods, and the efforts that go into making them. When I began carving my own decoys, it was to augment my hunting rig. I dabbled intermittently with various media and forms for a couple years,until I discovered the historical decoys from my local area. Thereafter I focused my efforts on the Delaware River style decoy, which has a long and revered history in the area I call home. The grace and simple beauty of the Delaware River style cannot be overstated. I count it a privilege to follow in the footsteps of some of the greatest carvers in history and to make this style of decoy with my own special flair and artistry. 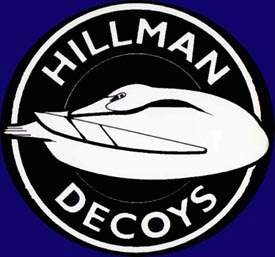 Perhaps Rod Taylor of "Hunting and Fishing Collectibles Magazine" said it best, " ......most of Hillman's decoys are in the traditional Delaware River style, but with enough style to make each quite unique to his workshop." This page is dedicated to my father Edwin W. Hillman, who passed away in July 2007. Not only did he teach me the skills of wood working, but of life. Among them faith, true friendship, and quality in whatever you do. Thanks Dad! For a number of years I enjoyed entering competions, earning many awards, including Best of Shows. Eventually I was asked to be a judge instead of entering the contests myself. This meshed well with my desire to move away from the competitive arena, prefering to work based on creativity and imagination, rather than a set standard. Today I continue to evolve my carving style and take inspiration from both the natural and artistic world. In addition to waterfowl I carve many other species. Folk Art, Paintings and other unique pieces also come from my workshop. All are made in classic styles, and incorporate original designs. I teach several classes a year at the Tuckerton Seaport Museum and occasionally at other venues throughout the country. I do the lion's share of my carving with old, but very useable hand tools. Many of which were passed down to me from my father and great-grandfather. 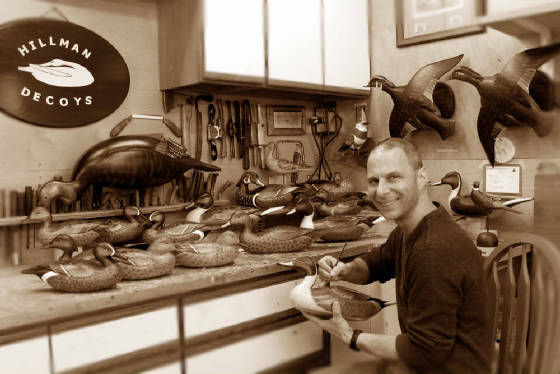 Carving decoys with the traditional techniques I use is a joyous retreat. The efficient use of drawknife and spokeshave, is a relaxing and time honored method of prodcing decoys. All my decoys are made from clear kiln-dried white cedar, which lends itself well to these methods. For painting I choose the traditional approach once again. My decoys are hand painted, by brush, using only the finest quality oil paint. Oil produces a lustre and patina unmatched by any other media. This traditional approach has worked well for me, with my decoys growing in desirability and value with each passing year. I will continue to produce a limited number of decoys for the discriminating client, keeping in mind my goal to uphold the tradition of fine decoys. In addition to this website more of my work can be seen in an article by Allen Linkchorst in the MAY/JUNE 2006 issue of "Decoy Magazine", multiple issues of "Hunting and Fishing Collectibles Magazine" and on the 2006 NJ Waterfowl stamp . I thought some of my friends might enjoy seeing a video on my outlook on carving. You can view it by following the link below.